During our experiments with thermal imaging we created a database containing facial portriats taken in visible and thermal spectra. In our case, the DSLR is Canon EOS 600D, with a 14-bit CMOS sensor registering 5184  3456 pixels with 74:2  27:5 eld of view (FOV), interfaced by USB 2.0 (see Fig. 2), and the IR camera is FLIR SC325, with 16-bit sensor of 320  240 pixels working at 60 Hz, having 25  18:8 FOV, interfaced by Ethernet. erent subject (class). Every class folder stores raw images captured from IR and DSLR cameras, naming them accordingly: #imageNumber deviceID. saved in Matlab structure), images after cropping (crop), and images fused together from cropped faces, thermal and visual (fusion). Sample images from our database are presented below. 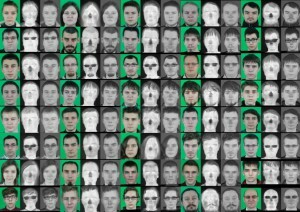 The WIZUT Face Database contains over 100 classes (with 5 image pairs per class, e.g. thermal and visible). The WIZUT Face Database will be available soon.